Moving to Pennswood Village—or any other senior living community—will provide you with many wonderful lifestyle benefits, but the decision to move may also raise questions. We’ve prepared this information to provide answers to some of the questions we’ve been asked most often. If you have additional questions, please call 215-504-1118 and a Pennswood Village sales counselor will be happy to provide the answers you need. I’M NOT SURE I’M READY FOR A RETIREMENT COMMUNITY. WOULDN’T IT BE BETTER TO WAIT UNTIL I NEED TO MOVE? Senior living experts agree that the best time to make a move to a retirement community is while you’re active and in good health. Living at Pennswood Village will free you from the constant work and worry of maintaining your own home, so you’ll have time to do the things you always wanted to do. If you wait until you need assistance to make your move, you may miss out on the many joys of active senior living. And if you’re the right age but not yet retired, you should know that many of our residents are still pursuing their careers. WHAT IS PENNSWOOD VILLAGE? WHAT MAKES IT DIFFERENT FROM THE REST? As early as 1973, a group of forward-thinking Pennsylvania Quakers envisioned a diverse community where all people could enrich mind, body and spirit. Their vision became a reality in 1980 with the opening of Pennswood Village. Now home to more than 400 residents, our community is a nationally respected continuing care retirement community for people ages 65 and older. Our progressive philosophy continues today, as we continually welcome change and improvements to enhance resident wellness and enjoyment. Residents also appreciate that our community has met the national standards of the Commission on Accreditation of Rehabilitation Facilities and Continuing Care Accreditation Commission (CARF-CCAC) since 1987. Pennswood Village is guided in its management philosophy and practices by the principles of the Religious Society of Friends (Quakers). Respect for the dignity and worth of each life is inherent in Quaker beliefs, and this respect supports the quality of care and services provided for residents, and extends to relationships among residents, employees and board members. WHAT IS A LIFE CARE CONTRACT? Our Life Care Contract guarantees access to all levels of care when needed, either temporarily or permanently, with fixed costs that are clearly outlined up front. Except for an annual cost of living increase, the cost of meeting a resident’s healthcare needs will remain stable. All required current and future healthcare is delivered on campus by trusted staff, and with no hidden costs or surprises. A Life Care Contract offers the most comprehensive level of healthcare coverage available in a senior living community. Choosing Life Care means you’ll know where and from whom you’ll receive any healthcare you need, and that your family members will be spared the difficulty of making care decisions in a time of crisis. You’ll also benefit from Pennswood Village’s person-centered focus on wellness, and gain access to on-site fitness programs, flexible and healthy dining, preventive care and 24-hour emergency response. WHICH HEALTHCARE SERVICES ARE INCLUDED IN THE MONTHLY SERVICE FEE? Our Life Care Contract assures residents that they will be able to move from independent living to our personal care residence, and to receive skilled nursing care, should such services ever be needed. Life Care allows couples to continue living right here—even if one of them requires additional assistance or care—while the other stays in independent living. Pennswood Village also offers access to an on-campus medical clinic, including exams and screenings, laboratory services and a full pharmacy. Rehabilitation services offer physical, speech and occupational therapies. 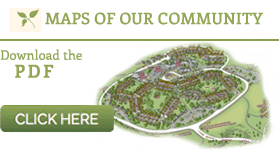 IS PENNSWOOD VILLAGE AN ACCREDITED COMMUNITY? Yes. Since 1987, our community has met the rigorous national standards of CARF International’s CCAC, a distinction shared by fewer than 300 senior living communities in the United States. CARF accreditation requires a commitment to continuous quality improvement, a focus on the unique needs of each person we serve and monitoring of the results of services. Apartments range from a 504 square foot studio to a 1,470 square foot, two-bedroom home, with 10 distinct sizes and floor plans. Each of these well-appointed residences offers a floor plan that features ample closet space, washer and dryer, full kitchen and a 24-hour emergency medical alert system. WILL I NEED TO CARRY HOMEOWNERS INSURANCE ON MY RESIDENCE? Pennswood Village provides insurance for the buildings and grounds, but you will need to obtain a renter’s insurance policy to cover personal property and liability. IS LIVING AT PENNSWOOD VILLAGE AFFORDABLE? The cost of living at Pennswood Village compares very favorably with the cost of maintaining your own home, because so many things you are paying for now are covered by your Monthly Service Fee. Completing our Compare the Value worksheet will help point out the cost advantages. WHAT FEES DO RESIDENTS OF PENNSWOOD VILLAGE PAY? Each Pennswood Village resident is responsible for paying a one-time Entrance Fee and recurring Monthly Service Fees for the right to occupy an apartment, to enjoy the services and amenities, and, with a Life Care Contract, to cover healthcare costs. Residents are eligible for significant IRS medical deductions on both the Entrance Fee and Monthly Service Fees if they opt for a Life Care Contract. We recommend that you consult a financial planning professional to help determine your eligibility for deductions. A member of our Marketing Staff can answer any additional questions and provide details. WHAT IF I ALREADY HAVE LONG-TERM CARE INSURANCE? For those with long-term care insurance, Pennswood Village will be glad to help determine how the benefits of the policy may complement the services covered by the community’s entrance and monthly fees. WHAT AMENITIES ARE AVAILABLE FOR RESIDENTS? Wellness amenities at Pennswood Village include a state-of-the-art fitness center, a 60-foot lap pool and a warm water exercise pool, walking trails, dog park, croquet field, bocce court, a putting green, and fitness classes, including Tai Chi, yoga and Zumba. Cultural and activity amenities include an auditorium with monthly concerts by professional musicians and movies, a library with an extensive collection, several art galleries for contemporary art and resident-created work, craft and game rooms, a greenhouse, and a woodworking shop. Lifestyle amenities include a living room with a fireplace, several dining choices ranging from waited service to casual dining and private dining for special occasions, beautiful landscaping and a natural meadow, community garden, pharmacy, full-service bank and ATM, full-site generator, full-service salon, covered parking, transportation, gift shop, and village store. You may bring your car. There is open parking throughout the community and covered parking is available for an additional fee. WHICH SERVICES ARE INCLUDED IN THE MONTHLY SERVICE FEE? The services included are one meal each day; local transportation for shopping, banking, train connections and houses of worship; medical transportation to physicians and hospitals; intergenerational programs at several local schools; weekly housekeeping and linen service; annual heavy housekeeping services; apartment maintenance service; trash disposal and recycling; mailroom with postal services; wireless Internet throughout the community; plus many optional services, available for a reasonable fee. IS THE ENTRANCE FEE OR MONTHLY SERVICE FEE SUBJECT TO CHANGE? Both the Entrance Fee and Monthly Service Fee are reviewed annually by the board of directors and management and are adjusted based on actual operating costs and sound financial practices. A 30-day written notice is provided to all Pennswood Village residents in advance of any increase in the fees. I’D LIKE TO RESERVE MY SPOT—WHAT IS MY NEXT STEP? We invite you to come for a visit! Please call 215-504-1118 to schedule lunch and a personalized tour so you can find out all you need to know about Pennswood Village. WHAT IS A FEE-FOR-SERVICE CONTRACT? You want the option to choose your own means of providing for future healthcare needs. If you meet any or all of these criteria, you’ll experience lower entrance and monthly service fees, since you’re not pre-paying for future healthcare needs. And while you’ll have access to the extraordinary, on-campus healthcare* at Pennswood Village, you’ll simply pay for any healthcare services you use as needed. Eligibility for a Fee-for-Service contract requires that prospective residents be Medicare eligible, with Parts A, B and D coverage. Supplemental insurance is recommended to cover any costs not paid by Medicare, since any shortfall in coverage is the responsibility of the resident. As an extra means of financial protection, long-term care insurance is also recommended.